Oh joy! 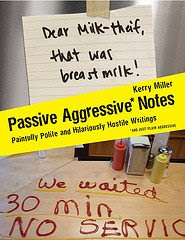 The website that collects real deal passive aggressive notes has now released the best of its collection into a book! A few years ago, I sent an email asking who stole my DAMN eggroll from the fridge at work. That email led to a confession from a new hire that he had accidentally used someone else's Wishbone Ranch Dressing at lunch the day before which led to the managing partner demanding his head on a platter. She was joking, I was not. I was PISSED about that eggroll! So I probably need this book. I have to say that I'm also guilty of leaving notes in bathroom stalls at work. Hygiene (or lack thereof) in shared spaces is a big annoyance of mine. Several of us would leave notes pinned in the offending stall. They did work! Either that, or the person polluting would do their business on another floor. Result! You're reminding me of the episode of Friends where someone steal's Ross' sandwich - that's may fave episode. This book looks awesome, I love stuff like this. Another interesting and random book is called "Index", check it out at thisisindexed.com. I've been following her blog for awhile. The entries are so random and interesting.